As more and more people become interested in eating raw, so do I as a soon to be dietitian. I want to know some good products out there so that I can recommend these to my patients if they are interested in eating raw. 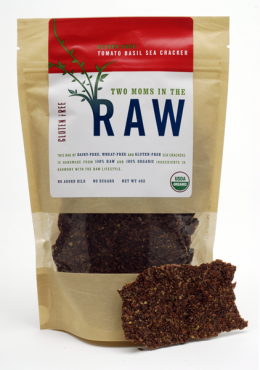 I found a brand that I really like called Two Moms in the Raw. They sell a variety of savory and sweet raw products. For my review, I was sent the almond butter cacao truffles, tomato basil sea crackers, blueberry granola, cranberry nut bar, and blueberry nut bar. Of these products I fell in love with two of them. I love the cacao truffles which clock in at 140 calories each and have some healthy protein and fat in them. They are filling because of the almonds and have a semi-sweet taste. They are a perfect snack or dessert. I also love the tomato basil sea crackers. These crackers are completely raw and delicious. I have been having them at lunch each day with some spreadable goat cheese on it. These products have no added oils, are 100% vegan, 100% organic, 100% raw, handmade, and have no added sugars! 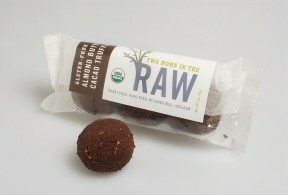 I really love these raw products and think you will too! UPDATE: The blueberry granola bars are amazing! I didn't try them until after I posted this but can't stop eating them. They are extremely chewy and taste great. I am taking them with me on my plane trip tomorrow. The giveaway will be for 3 products of the winner's choice from Two Moms in the Raw to one lucky reader of The Nutritionist Reviews. The giveaway is open until Midnight on Wednesday September 21st. Winner will be chosen on Thursday September 22nd using Random.org. The winner will have 48 hours to respond or a new winner will be chosen. Visit the Two Moms in the Raw website and let me know which product that you want to try the most! I would like to try the mango chia bar. just signed up for swagbucks! I would to try any of the granola, im a granola fan =^) Thanks for the chace to win. I would love the chance to try the Garden Herb Sea Crackers. I already like your page, I have entered all of your contests and joined the facebooks, and aleady on groupon. I would love to try the Berry Granola. I would love to try the Bluebery Granola ! I'd love to try the cinnamon cereal! I'd love to try the Blueberry Nut Bar (Gluten-Free). I follow you on GFC (rusthawk). I'd like the cocoa chia bar. I'd like to try the Blueberry Nut Bar. Thanks! The blueberry granola sounds yummy! I entered the snack aisle giveaway! almon butter cacao truffle.....ahy yiyi yi!! !